Short in the ankle but long on beneficial features, Glenmuir Plain and Patterned Bamboo Secret Socks are exactly what you need to keep feet healthy and happy – even though no one will know you’re wearing them! 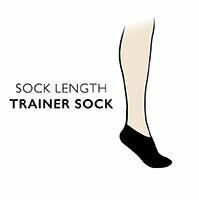 The socks are manufactured to a high standard, with hand linked toes for smooth seams. Light, fine and silky-soft, bamboo-based fabric cares for skin by being naturally antibacterial. It’s able to maintain an optimum, comfortable skin temperature at all times, absorb and wick moisture swiftly, so feet stay dry and fresh for longer. In triple pack sets, Glenmuir Plain and Patterned Bamboo Secret Socks come in a choice of fashionable designs and styles.